Reconstructive flexor tendon surgery can be extremely difficult. The zone of failure will determine the potential reconstructive options that are available. For the thumb, tendon grafts as well as potential flexor digitorum superficialis tendon transfer are options for reconstruction. In the digits fusion as well as 2-stage tendon reconstructions are options. If the flexor tendon sheath is still intact, a single-stage tendon graft can sometimes be successful. These surgeries can be fraught with complications including failure of the graft to heal, rupture of the graft, scarring of the graft, and hand stiffness. These types of surgeries really should be performed by someone who performs hand surgery on a regular basis or who has specialized training in hand surgery. Both skill and creative thinking are required to succeed in these reconstructions. However, even in the best of hands, these cases may not turn out as the patient and surgeon had hoped. 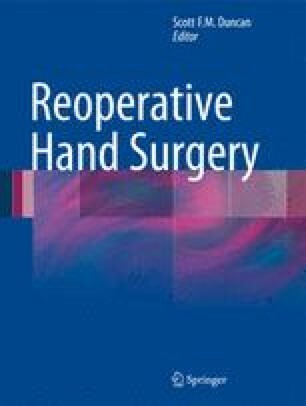 This chapter discusses the options available for reconstructing the finger or thumb that has failed initial repair.